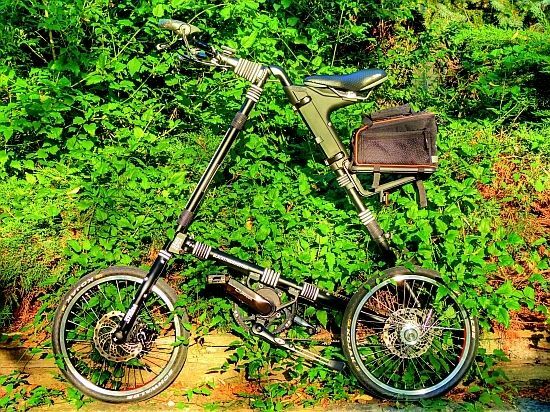 Strida Forum • View topic - Saddle height? For a period of few years I was actively using Strida for commuting -- about 25 km a day. From my road bike experience I know that the height of the saddle must allow you to straighten your leg when the pedal is in its lowest position. It will make the pedalling more efficient and you will be able to cover more distance without getting tired too much. 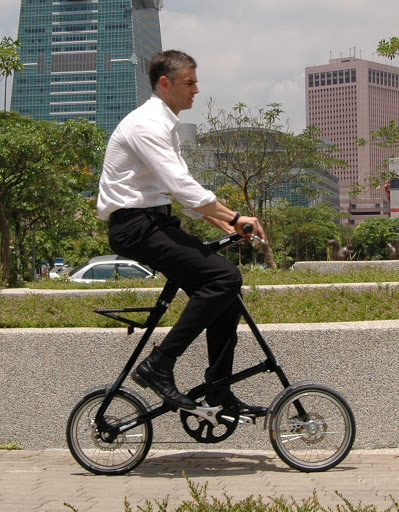 So on my Strida I raised the saddle to the highest position such that I resemble myself a clown on a monocycle. But I'm quite satisfied after getting used to get on and off the bike. Recently we went shopping for a new bike for my daughter and bought a new SX. Promise it wasn't my influence! She wanted this Amsterdam-style girly bike, but changed her mind at once when she saw this shiny yellow Strida. She tried it and the shopping was over. Anyway -- the guy at the shop said that Strida was designed to ride on with bended knees and with your pedals far in front of you rather than below. Is it true? I understand that this makes it easier to get on and off the bike and also to get used to maintain the balance. Are there any other reasons to keep the saddle lower? Will I be able to cover 25 km a day with the saddle set up this low? Whom do you trust more; the guy at the shop or Mr. Mark Sanders, the inventor of our bikes? Below...that's him...does that tell you anything? I'm 1,89m, my saddle height on 16" wheels is the highest possible, with 18" wheels one step below. - Use the front brake carefully. - Long legs will need a bent steering, too. Thank you BSA! I knew that Mark Sanders rode like this but I believed this is because he's also tall. Now I'm reassured. Sure, that's also because he's tall. I suggest gradually raising your saddle, perhaps half an inch (1 cm) at a time. Each time you raise it, ride the bike. If it doesn't feel noticeably worse to ride, ride it for at least a couple of miles/km. If it had been too low before, your bike will feel lighter and faster with the new riding position. If raising the saddle improved things, raise it again, and ride some more. Keep doing this until the saddle is finally too high, then lower it just a bit.